Situated a short distance from the seafront promenade, within walking distance of Maspaloma's extensive stretch of sand dunes, these well-equipped central apartments are a great base for your vacation. The property includes 4 independent buildings. Each unit has a twin bedroom, a small living area with sofa bed, a kitchenette with fridge and 2 electric hot plates, a private bathroom and a terrace or balcony The complex has a large central swimming pool, with a separate pool for kids, a large sun terrace, a tennis court, pool tables, and a restaurant-cafe with terrace. Breakfast and half board are also optional add-ons. Playa del Ingles is the largest tourist resort on the island and offers a wide range of bars, clubs and restaurants and recreational activities. Located in a peaceful spot, the bungalows are found in Playa del Inglés, just a 10 minute walk away from the beach with the spectacular dunes of Maspalomas. You can also find the main shopping centers a short walk away: Cita, Yumbo and Sandía. The Cordial Biarritz consists of 76 completely renovated units, a poolside snack bar and a restaurant with terrace. The Don Palomón apartments in the south of Gran Canaria offer direct access to the Playa del Inglés beach. They have a swimming pool, Jacuzzi and free Wi-FI. All of the apartments have a bedroom and separate living room with sofa bed. They have large flat-screen satellite TVs with international channels and a DVD player. The kitchenette has a toaster, coffee maker, fridge and microwave. 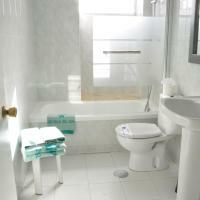 The bathrooms are modern and most apartments have a sea view. The Don Palomón complex has a sun terrace with loungers. It also offers free parking. Playa del Inglés has plenty to do and many places to eat and drink. The Cita shopping and entertainment center is just a 5 minute walk away. Apartamentos Patricio has a beachfront setting in Gran Canaria, with views over the Maspalomas Sand Dunes and Playa del Inglés. The apartments all include free Wi-Fi and a balcony. 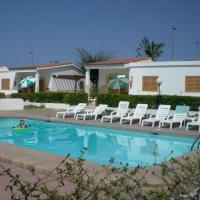 The Patricio is a small apartment complex with a lovely swimming pool, Jacuzzi and sun terrace. Apartments all come with a satellite TV and a DVD player. A bathrobe and a teapot are included. There is a spacious kitchen area and a private bathroom. The Maspalomas Golf Course is within walking distance of the Patricio. Free public parking is available nearby. 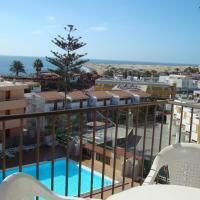 Apartamentos Carasol are just 110 yards from Playa Del Inglés Beach, and have wonderful views of the Atlantic Ocean. The apartments share a sun terrace, garden and a swimming pool. Each Carasol apartment has a private balcony or terrace. They also have a living room with a sofa and satellite TV, as well as a kitchen area with a ceramic stove and a fridge. Bed linens and towels are provided. Carasol Apartments are set in the heart of Gran Canaria's Playa Del Inglés resort. 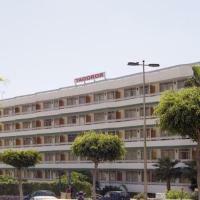 The famous Jumbo Shopping Centre is a short walk from the complex, and Maspalomas Golf Course is about a half-mile away. The apartments have a tour desk. They also offers bike and car rental services. Free public parking is available nearby. Centrally located in Gran Canaria’s Playa del Inglés, Apartamentos Tagoror is 500 metres from the beach and the lively Yumbo Centre. It offers 24-hour reception, free Wi-Fi and an outdoor pool on the 5th floor. Each apartment features a balcony or terrace with garden views. There is a living room with a sofa bed, safe and TV. Each has a private bathroom and a kitchenette with a fridge, microwave and coffee maker. Luggage storage is offered and there is a tour desk. There are bus stops nearby for connections to the rest of the island. Gran Canaria Airport is a 25-minute drive away. Terrazamar Apartments are 165 ft from Playa del Inglés Beach, in southern Gran Canaria. A 10-minute walk from the lively center of town, they feature an outdoor pool and Atlantic Ocean views. Each bright, stylish apartment features hardwood floors, and has a private balcony, most with ocean views. There is a living room with flat-screen satellite TV and a sofa bed. Apartments at Terrazamar have a kitchen with a fridge, microwave and coffee maker. A safe is available for a supplement, and there is a communal washing machine and dryer, which can be used upon request. There is a free Wi-Fi zone at Terrazamar, as well as a tour desk. Maspalomas Dunes are a 20-minute walk from the apartments, and Maspalomas Golf Club is 2.5 miles away. These tranquil bungalows are located next to Gran Canaria's Maspalomas Golf Course and just yards from the famous sand dunes. Each has a private yard and there is a communal pool. The Sun Club Superior enjoys a quiet location on the island while still being within easy reach of Playa del Inglés's local stores, restaurants and facilities. Spread out over the lush grounds, the Sun Club Superior bungalows are surrounded by tropical flowers, shady palms and a swimming pool with sun terrace. Children can play safely in their very own pool. Each Sun Club bungalow measures 753 ft² and features a spacious lounge with sofa bed, a master bedroom and a well-equipped kitchen. Prepare meals together as a family or group of friends before dining on the furnished terrace of your private yard. In the evening, sit together and enjoy a DVD on the player provided. A cleaning service with a towel change is provided 3 times a week along with a change of bed linens once a week. Surrounded by attractive gardens, Bungalows Los Girasoles provide a tranquil setting in which to enjoy your family vacation in the Canarian sunshine. Each bungalow in Los Girasoles boasts its own small front garden, where you can sit back and soak up the sun in complete privacy. Prepare your own meals in the bungalow's kitchen, before relaxing with your family in the lounge area. As well as relaxing in the complex, you can also take a walk down to the nearby beach in Playa del Ingles - with golden sands and cool Atlantic waters. The complex also comes with a bar, where you can enjoy a drink and a chat in the evenings. Alternatively, you can stroll into the center of lively Playa del Ingles to sample the local nightlife. This large apartment complex is set in the center of lively Playa del Ingles, on the island of Gran Canaria, and is an ideal accommodation for a fun-filled family vacation in the sunshine. Each of the apartments in Maritim Playa comes with a living room, where you can relax with your family, and an open-plan kitchen, where you can prepare meals. Spend the day soaking up the sun on a lounge chair around the pool, while the children play and swim, and make friends. Alternatively, you can head to the expansive sands of the nearby Playa del Ingles beach. Return to the complex in the evening to dine in the on-site restaurant with the family. There you can enjoy buffet-style cuisine, followed by a drink in Maritim Playas bar. Keep up to date with your email at the complex's internet corner. The Los Porches complex has 11 different swimming pools, including 2 for children. 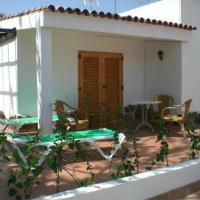 Set just 500 metres from Playa del Inglés Beach, each bungalow features a terrace and small garden. The bright, spacious bungalows at Los Porches are equipped with Wi-Fi internet access. A safe is available to rent. One extra bed can be added to all bungalows for free, and 2 children under 12 years stay free in existing bedding. The Los Porches' restaurant Santa Ana is situated 500 metres away, featuring fabulous, panoramic views and serves traditional buffet-style meals. All bungalows have 2 twin bedrooms and a kitchenette with kettle, microwave and hob. The CITA Shopping Center is 500 metres from the Porches complex. and The Yumbo Leisure Center is 1 km away. Gran Canaria Airport is within 17 km. The Cisne complex consists of inviting apartments in a superb location, just 150 m from the popular Playa del Inglés beach. Get the day off to a good start by enjoying a hot drink on the balcony from your spacious apartments tea/coffee maker. You can rent the satellite TV. Then wander down to the golden beaches and soak up the Canarian sunshine. Come back to the Cisne for a swim in the huge outdoor pool, or simply relax on the sun beds. Cook a leisurely lunch in the well-equipped kitchen. Located 300 metres away, Santa Ana Restaurant offers great panoramic views and buffet meals. Alternatively, take advantage of the free parking and car rental service to discover the rest of the island. Los Valles I has prime location in buzzing Playa Inglés in Gran Canaria, just 500 m from the stunning Maspalomas Natural Park. Each bungalow has a parking space. Sit back and relax in your spacious bungalow, with well-equipped kitchenette, air conditioning and heating, satellite TV and DVD player, as well as lovely views of the attractive grounds. Walk down to the sandy beach, or sunbathe around the outdoor swimming pool located in the centre of the Valles I complex and surrounded by a garden area with sunbeds. Located 500 metres away, Santa Ana Restaurant offers great panoramic views and buffet meals. The Santa Bárbara bungalows can be found in a quiet residential area of the Playa del Inglés beach resort. The complex has 5 swimming pools. The Santa Bárbara bungalows each have a private terrace. They also have a kitchen with microwave, tea and coffee-maker, and fridge. The swimming pools are set in the Santa Bárbara’s gardens, which are filled with palm trees. There are also terraces where you can sunbathe. The bungalows are just 100 metres from the Maspalomas Golf Course and 15 minutes' walk from Playa del Inglés beach. The area also has a large range of restaurants, bars and nightlife. The Jumbo Shopping Centre is just 5 minutes’ walk away. There is also a bus stop nearby, allowing you to explore other parts of Gran Canaria. Villa Santa Ana is situated in the center of Playa del Ingles, just a short walk from the nearby beach, and provides bungalows equipped with large terraces and gardens. Villa Santa Ana boasts a lovely garden, where you can enjoy a stroll in the evening, and admire the stunning sunsets of Gran Canaria. Start your day with breakfast on the terrace of the hotel, while admiring views of the sea and surrounding town. There you can soak up the morning sunshine, before heading down to the beach a little later on. Return to your bungalow in the afternoon, and enjoy a typical Spanish-style siesta. In the evening, you can barbecue with friends or family, and enjoy the cooler temperatures. Apartamentos Green Park are 550 yards from the beach, in central Playa del Inglés, Gran Canaria. The complex offers outdoor pools, grocery store and bank. All apartments have a double bedroom, kitchenette, bathroom and a balcony. There is also a comfortable lounge, with a sofa-bed and coin-operated satellite TV. The Green Park Apartments complex has a 24-hour reception, with currency exchange and car rental. 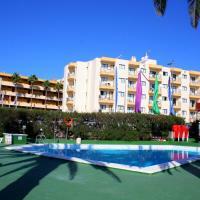 There is also a large sun terrace, and a separate children’s swimming pool. The complex has a restaurant and an Irish bar. 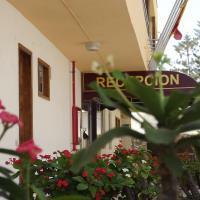 It is located only 55 yards from the Aguila Roja Shopping Center. The bars and restaurants of the center of town are just a short walk away. The Guatiza complex is less than a 5-minute walk from Playa del Inglés Beach, in the south of Gran Canaria. It has a rooftop terrace with sea views. Apartamentos Guatiza has 2 outdoor swimming pools, including one for children. There is also a large terrace that is ideal for sunbathing. Nearby you will find the Cita Shopping Center, which has restaurants, shops, grocery stores and a pharmacy. Gran Canaria Airport is about 19 miles away. All Guatiza apartments have a kitchen and a private bathroom. They also have a small terrace that overlooks the pools. They can sleep up to 3 people. Children under 12 years stay for free when using existing beds. 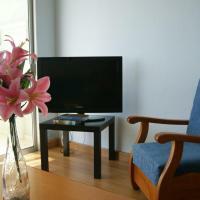 Each apartment at San Nicolás has free Wi-Fi, an LCD TV and a safe. There is a shared outdoor pool, sun terrace and gardens, with wonderful views of the sea. The San Nicolás apartments are just 110 yards from Gran Canaria’s Playa del Inglés Beach. The resort center has a range of bars and restaurants. Maspalomas Golf Course is less than a mile away. Each San Nicolás apartment has a private balcony, with views of the sea or the swimming pool. There is a living room with a sofa bed. The kitchen area includes a stove, fridge and microwave. Miraflor Suites is set in central Playa del Inglés. The complex boasts freshwater swimming pools, a sauna, on-site mini golf and a free shuttle to the beach. Each bungalow and studio at the Miraflor Suites comes with a furnished terrace and satellite TV. All have a kitchenette with fridge, microwave and coffee machine. There is also one free crib. Wi-Fi access is available in all areas of the complex. 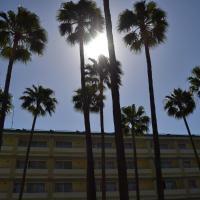 Buffet meals, live entertainment and 24-hour reception are offered at the Aparthotel Rondo, across from the Miraflor. The Kasbah Shopping and Leisure Center is only 660 yards from the Miraflor. The Yumbo Shopping Center is a 5-minute walk away. Rebecca Park features whitewashed buildings set around a lovely swimming pool, surrounded by gardens and terraces. The complex is 655 yards from Playa del Inglés and has an on-site grocery store. All of the bungalows and studios at the Rebecca Park come with a private terrace. An electric stove, satellite TV and a tea/coffee maker can be found in the kitchen. Facilities at Rebecca Park include an internet corner, tennis court and miniature golf course. The restaurant serves buffet meals, while there is also a bar and pool bar. An entertainment program is offered in the evening. Playa del Inglés lies in the south of the island of Gran Canaria. The airport is about 15 miles away. 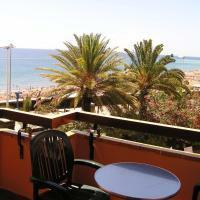 Apartamentos Dunasol are just 655 ft from Playa del Ingles. They offer a sun terrace and outdoor pool, heated in winter, and free Wi-Fi in public areas. All apartments at Dunasol include a balcony with views of the grounds or swimming pool. The living room has satellite TV and a sofa bed. There is an open-plan kitchen with a stove, coffee-maker, microwave and teakettle. The apartments are cleaned and the towels are changed 3 times a week. Bed linens are changed once a week. The Apartamentos Dunasol can be found in a quiet area of Playa del Ingles, with beautiful dunes and beaches within a 2-minute walk. There are also cafés, restaurants and supermarkets nearby. This adults-only complex is located in Playa del Inglés, Gran Canaria. Just 100 metres from the Maspalomas sand dunes, it has an outdoor pool with loungers and offers free Wi-Fi. Each apartment at Apartamentos Judoca Colours contains a CD player and a flat-screen TV with international channels. There is also a private terrace with loungers and parasol attached to each apartment. All apartments at the Judoca Colours are decorated in a modern, minimalist style and each one in a different colour. They all consist of a bedroom, kitchen and living-dining area. Maspalomas Golf Club is 600 metres away from the complex, and Yumbo Shopping Centre is just 400 metres away. Gran Canaria Airport is 25 km away from Judoca Colours. Situated 380 yards from Playa del Inglés Beach, Los Cactus offers 2 outdoor swimming pools, a terrace and grounds. Each apartment has a balcony with views of the Atlantic Ocean. Each spacious, functional Los Cactus Apartments has a lounge with a sofa and international cable TV. The kitchenette includes a coffee machine, fridge and stove, and cooking utensils are provided. Situated in the center of Playa del Inglés, the apartments are 330 yards from the Kasbah Shopping Centre. There is a range of bars, restaurants and clubs within a 5-minute walk. 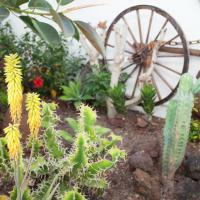 The staff at Los Cactus can provide information about Gran Canaria and arrange car or bike rental. Playa del Sol features modern apartments with balconies overlooking the pool or grounds. In the center of Playa del Inglés, this adults-only complex is a 15-minute walk from the beach. Each spacious apartment has a kitchen with a microwave, fridge and coffee-maker. All have a bathroom and living area with sofa bed. A flat-screen TV and safe are available for rent. Guests can relax on the lounge chairs surrounding the outdoor pool. Massages can be arranged and there is a game room with internet access. The famous Maspalomas sand dunes can be reached in 15 minutes, by foot. The 24-hour front desk can organize excursions and car rental. The Playa del Sol complex has an on-site restaurant and poolside bar. It has direct access to the Yumbo Centre, with a range of bars, cafés and restaurants. These apartments are 55 yards from Playa del Inglés Beach, in southern Gran Canaria. Set on tropical grounds, they feature an outdoor pool with lounge chairs, and superb beach views. The Carmen Apartments are just a 15-minute walk from Maspalomas Dunes and the lively center of Playa del Inglés, with its famous Yumbo Shopping Center. Apartamentos Casas Carmen have a rustic Canary Island style, and are characterized by the beautiful purple flowers of its climbing bougainvillea plants. Each Casas Carmen apartment has a private bathroom, and a living room with satellite TV. There is a dining table in the kitchen area, as well as a fridge and coffee maker. The private balcony comes with a table and chairs. In lush tropical gardens, Parque Tropical is 325 ft from Las Burras Beach. It has a large outdoor pool, and each spacious room features a flat-screen satellite TV, and a balcony or terrace. The hotel has large gardens, and a terrace with lounge chairs. Sports and games available on site include ping-pong, billiards, tennis and minigolf. Varied seasonal entertainment is also provided. Parque Tropical has a sauna and a massage service. There is also a free Wi-Fi hotspot, a TV room and a children’s play area. The main restaurant serves a range of international and Canarian dishes. There is also a grill bar and a poolside bar. The large, popular Playa del Inglés Beach is less than half a mile away. A wide selection of shops, bars and restaurants can be found within a 5-minute walk. A bus stop is located outside the hotel, and free parking can be found nearby. Apartamentos Roca Verde are located just 50 metres from Gran Canaria’s Playa del Inglés Beach. The complex offers free Wi-Fi in public areas, an à la carte restaurant and an outdoor pool with sun terrace. Each functional Roca Verde apartment has simple décor and tiled floors. Apartments have a spacious living area with a sofa and TV, and a kitchenette with a hob and fridge. Bicycle and car rental can be arranged at the Roca Verde’s reception. Free parking is available nearby. The apartments are within a 10-minute walk of the Kasbah Shopping Centre. The surrounding streets are full of restaurants, shops and lively bars. Los Caribes is 165 ft from Playa del Inglés Beach, and a 10-minute walk from Maspalomas Dunes. They offer an outdoor pool, and apartments with pool or Atlantic Ocean views. Each Caribes apartment has a living room with flat-screen satellite TV and a sofa bed. There is a private bathroom, and the kitchenette is equipped with a fridge, microwave and coffee maker. The white apartments are in grounds and offer direct access to the beach promenade. The lively center of Playa del Inglés is a 10-minute walk away. You can rent a car or bike at Los Caribes's tour desk. Parking can be reserved, for an additional charge, near the apartments.